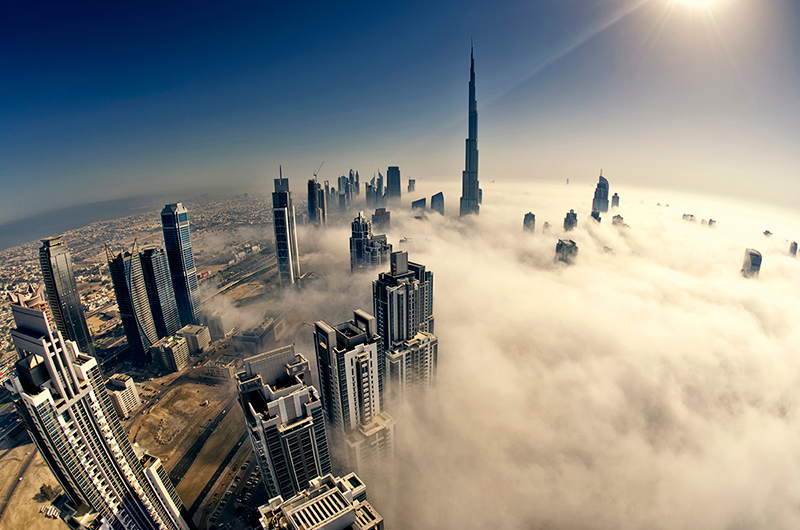 Burj Khalifa downtown, Dubai on a foggy morning. Shot from our office building(51+12 floors) terrace. It's heavenly view on every foggy day. Well, about the photo now... Dubai (UAE) experiences this sort of fog frequently during Nov to May every year. Its really fascinating to be soaked in the fog like this. Recently our office is shifted just close to the Biggest needle on earth (Burj Khalifa). What else a photographer needed! Its stunning view from our office terrace. Few more shots in this series are here. Thank you so much guys for the votes and lovely comments. Congrats on the blue! This is without a doubt one of the most amazing photos I've ever seen. Absolutely perfect in every way!!! Congratulations on the blue! What a standout! This shot is so dramatic and fascinating - I actually thought it was from a plane. Wow!!! So dramatic and breathtaking! It looks so surreal. So definitely award worthy!! Congratulations!! Congratulations,a great image no doubt. Definitely a WOW Shot! Congratulations! I thought this was DUBAI, and we should be there in SEPT, and am actually just wanting to mainly go there to experience this, I've seen it in photos before, pretty cool getting a blue in a FS! awesome shot... and the whole series. Congratulations! Amazing! I need to use the same lens more often! Well done!! Your photography of Dubai has been amazing, and it has inspired me over and again! Congrats on blue! Incredible shot! I missed this in voting, but wow, this is incredible. Congratulations on your blue! Well deserved. Oh wow, I love the perspective and the fog. That's one heck of a view! i wanna read the story to this one - great timing and one of those shots where (imo) that wide angle curvature on the edges actually works to your advantage. WHOAAAAAAA, I think this is the winner, something out of a sci-fi movie, I feel, this is SPECTACULAR, see you on the front page, in first position! Those fisheye shots are great. Love the perspective. wow. Wow. WOW! Not only do you have an amazing vantage point, but to have the fog and sun in there too? Amazing. What a view... That's what they call "being on top of the world". I don't know if the clouds were photoshopped in or you actually saw this thru the lens. Either way I dig it and I've never seen a shot quite like this before. AWESOME! The Burge is more than twice as tall as the next tallest building. I love the fog/sand, but find the distortion at the far left really distracting. Crazy good shot. Love the FE and the clouds. Dubai? Proudly hosted by Sargasso Networks. Current Server Time: 04/18/2019 06:29:27 PM EDT.